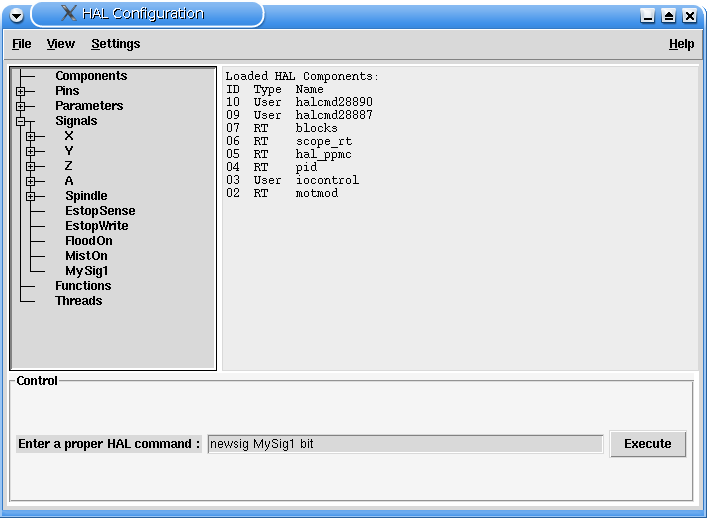 Halconfig is a graphical interface designed to help simplify the process of configuring your HAL hardware abstraction layer. If it is already installed you should get some answers like this. bwidget is already the newest version. With that package in place, and a running EMC2 when you startup halconfig you will get a display a bit like the one shown below. has already been entered and you can see that the signal named MySig1? is shown in the tree. The menu -> Settings -> Watch allows you to click on leaves in the tree and see what their values are while you run the EMC2. The refresh on these is dreadfully slow but it will show things like the state of estop and how that and machine on affect the values of pins. Good luck and add your observations here.